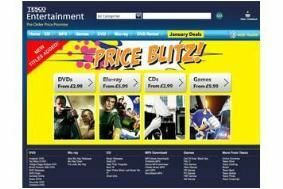 HOT DEALS: Price blitz on Blu-rays, DVDs and CDs in Tesco.com sale | What Hi-Fi? Blu-ray bargains we've spotted include The Dark Knight, Clash of the Titans, Black Hawk Down, Gran Torino and The Matrix all at £7.99, 2012 and Minority Report for £9.99 each, and Harry Potter and the Half Blood Prince at £8.99. DVD deals include Sherlock Holmes at £6.99, 2012, Fast & Furious and Hurt Locker each at £4.99, Shutter Island at £5.99 and Blood Diamond £3.99. If it's music you're after, there's Lady Gaga The Fame Monster, Mumford & Sons Sigh No More, Gorillaz Plastic Beach and The Stranglers Decades Apart each at £3.99. And from Boxing Day Tesco will have more in-store deals on selected electrical goods such as a Samsung PS42C450 42in HD-ready plasma TV for £349 and Sony 32BX300 32in LCD TV for £299 (selected stores only, while stocks last). It's worth having a hunt around on the Tesco website as there are plenty more deals on offer.